Come view works from the Ethiopian Jewish Arts Workshop in Be'er Sheva, Israel. These clay sculptures were created by Adiseh Baruch, Yamai Buglah, Aviva Eshto, Mamit Sheto, Hana Yaacov, and Tziona Yahim to preserve Ethiopian Jewish community heritage through art. The exhibit is co-organized by Michael Hittleman, Hittleman Gallery of Fine Israeli Art; Patricia Greenfield, UCLA Department of Psychology distinguished professor; and Michael Weinstock, senior lecturer at Ben-Gurion University of the Negev. The sculptures will be on display through November 10 in the East Rotunda. 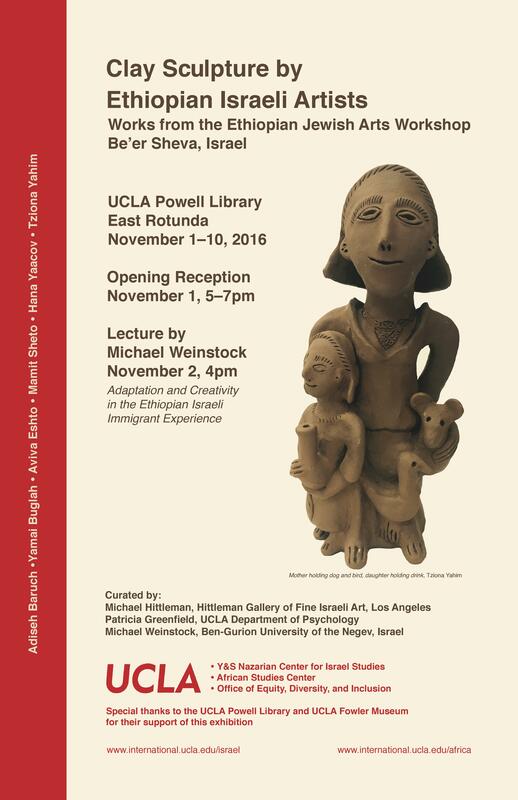 Special thanks to the co-curators; UCLA Younes and Soraya Nazarian Center for Israel Studies; UCLA African Studies Center; UCLA Office of Equity, Diversity, and Inclusion; and UCLA Fowler Museum for their roles in helping this exhibit come to the Powell Library.